This stamp worked great! Used it to stamp coffee cups. Logo stamp, Custom rubber stamp from your logo or artwork - custom logo stamp - custom packaging stamp custom stamp 1x1" 2x2" 3x3" 1x2" 2x4"
Well done, super cute stamp. Love it! Thank you so much! I can now stamp my logo on my packaging materials! New for the holiday season! 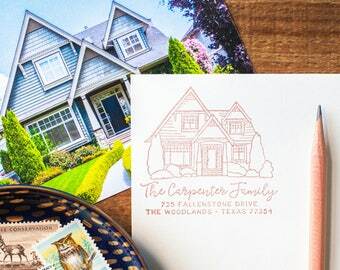 Custom home portraits made into address stamps!!! A modern classic address stamp paired with our moving postcards! Spring is here indeed! Sometimes you just have to get away from the desk! The Chatty Press got its name thanks to my corgi Einstein, he is super chatty in the morning. My iMac sits perched upon its 1970's desk. I do all of my design work on this workhorse. My designs start as a pencil sketch, Find the perfect typeface or hand letter them, then redraw & typeset digitally. Looking for custom wedding Invitations? I've always loved designing for print. I worked at various ad agencies and design firms and just love seeing something I worked so hard designing and creating, finally printed on paper. In 2009 I started a little etsy shop called Peppersprouts, where I have created a line of homegoods and personal accessories, but I still had an inkling to start a stationery line of my very own. While working with an amazing wedding photographer in Maine I designed some holiday photo cards and custom wedding invitations and I knew I wanted to be part of the wedding industry. With a little push from my then fiancé I launched The Chatty Press (and of course got started designing my own wedding invites and stamps). Why did I decide to call this new line The Chatty Press? Of course it has a little bit to do with the joy of conversation & shared experiences through hand written mail. But it was also named because of the chattiness of my Corgi EInstein. I look forward to expanding the chatty press to bring even more fun ways to add a bit of fun to every mailbox! A recent bride herself, Jen knows that every detail makes a statement. She lives on the coast of Massachusetts, with her husband, and their corgi Einstein. Jen also runs Peppersprouts, her home line also available on etsy. A local, family owned, stamp engraving partner who laser-cuts the rubber to help make by designs and ideas come to life. This partnership allows me to spend more time typesetting proofs and creating new designs. A super amazing Letterpress printer who helps turn my original artwork into beautifully printed cards and stationery. A lovely print shop that prints my hand lettered and illustrated work onto canvas! I love being able to turn my work into art for your home. Will I see a Proof of my personalized stamp before it is made? Yes. For all personalized stamps, a digital proof will be E-mailed to you within 2 business days. An approved proof is required in order to send your stamp to production. Please make sure your email address listed on your order is up to date. Logo stamps will only receive a proof if there are issues opening your file. Can I change designs if I hate the proof? I think you will be thrilled with the design, but in the off chance you are not, You can swap to a different design. Additional fees may apply if you want to change to a self inking stamp, but originally purchased a wood handle stamp. In the very rare case you still are not happy, I can cancel the order if you like, minus a $5 design fee. Oh No! I don't see my proof in my email and its been more than 2 business days! Please check your spam folder, occasionally emails do end up in there. Otherwise send me an email or an etsy convo and I will be happy to resend your digital proof to you for your approval. Yes! I love creating stamps and stationery for international addresses. Please note you will be responsible for any customs fees, taxes, duty or related tariffs that may be imposed by your postal service and government for incoming mail to your country. International transit time does vary, and can take 2-6 weeks for delivery. Shipping can take longer to Germany and Italy due to delays caused by strict customs enforcement. Please see individual listings for current shipping processing times. Personalized orders will get a proof via email within 2 business days. Proofs do need your approval before they are made, to make sure all spelling is correct! Once approved production takes 3-5 business days for personalized items. Expedited shipping options are available at checkout. Do you accept return for personalized items? Personalized orders may not be cancelled or refunded once final proofs have been approved. Once you approve the final proof and your order is placed into production, I can not accept any returns due to spelling, grammatically errors, etc. By approving the final proof you accept responsibility for the information & layout as shown in the final proof. If any error is discovered after you approve the proof, a reprint fee will need to be charged. I stand by my work, if an error or mistake has been made by myself or there is a production flaw I will gladly fix the problem and reprint your stamp free of charge. Do you accept returns for non-personalized items? Unused & unopened orders may be returned or exchanged within 7 days of you receiving the item. Buyer pays return shipping unless the item was damaged in shipping. Once I receive the returned items a refund or exchange will be issued. Shipping costs are non-refundable. Used, opened, and/or sale items cannot be exchanged or returned. This does not apply for personalized orders. My background is in print design so I'm always happy to design something new and exciting! If you are looking for a custom design please feel free to contact me via etsy or email me at jen[at]chattypress.com custom work is considered based on my available time. All designs copyrighted or trademarked and are the property of the Chatty Press. The Chatty Press stamps are for personal use only. All stamps are copyrighted designs, and are for personal, non-commercial use subject to the terms of this Agreement. Reproduction, redistribution or resale the Chatty Press stamps and/or designs are prohibited without written permission. Stamp impressions may not be copied, scanned or reproduced by means other than the stamps themselves.